This book offers analytical methods for studying human work in ergonomics and psychology that are similar to ones utilized by the engineering sciences. SSAT offers not only new qualitative but also formalized and quantitative methods of analysis. This book will describe quantitative methods of task complexity and reliability assessment, application of queuing theory, etc. The book will also present new data in the area of efficiency of labor force and its evaluation. Gregory Bedny presently resides in Wayne, NJ. He works as a Research Associate at Evolute, Inc. in Louisville, Kentucky. He is an American citizen who emigrated from the former Soviet where he earned his Doctorate Degree (PhD) in Industrial Organizational Psychology from the Educational University of Moscow and a Post-Doctorate Degree (ScD) in Experimental Psychology from the Institute of General and Educational Psychology, National Pedagogical Academy of Science of USSR. He also is Academician of the International Academy of Human Problems in Aviation and Astronautics in Russia and Honorary Doctorate in Science, Ukrainian State University. For his achievements in psychology he has been awarded the Medal of the Ukrainian National Academy of Pedagogical Sciences. He is the author of five original scholarly books, the latest of which were published in USA. The first one was co-authors with Dr David Meister in the US in 1997. This book published by Lawrence Erlbaum Associates, Inc. The second book was co-authored with Dr. Karwowski in the US in 2007. This book published by Taylor and Francis Group. He also is the co-editor of two books published by Taylor and Francis Group in 2008 and 2011. He was invited editor of journal Theoretical Issues in Ergonomics Science, V-5, #3, 2004. In former Soviet Union he worked as Industrial Engineer of Food Processing Machinery Factory, Industrial Psychologist in Industrial Research and Consulting Institute. After receiving his doctorate degrees he worked as associate and then full professor in Construction Engineering State University, in Marines Postgraduate School (part time), Pedagogical University in Odessa, Ukraine. He is author of different textbooks for universities in former Soviet Union. 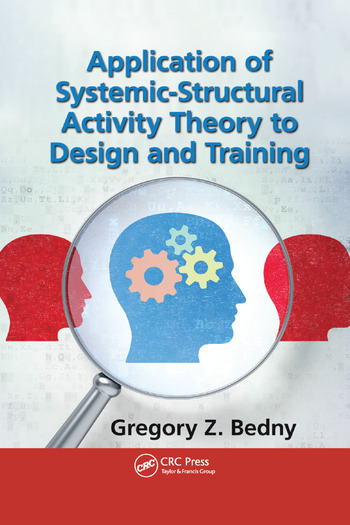 Dr Bedny has been conducting research on general and systemic-structural activity theory for the past 25 years. Systemic-structural activity theory is high level generality theory from which derived unified and standardize methods of study human work. He is the author of multiple articles in this field. He applied his theoretical study in field of human-computer interaction, manufacturing, merchant marines, robots systems, work motivation, training, reducing fatigue etc. "The book overcomes the traditional separation between cognition, behavior, and motivation using a systemic approach to the analysis of human work activity. The new approach enables a more user-friendly design of tasks in HCI and ergonomic design of complex human–machine systems such as operation of automatic or semiautomatic systems. … The authors did an outstanding job." "… presents a new systemic view based on activity theory to a very challenging multi-dimensional field. … The theory presented in the book is put into practice and can be used also by practitioners in different fields."